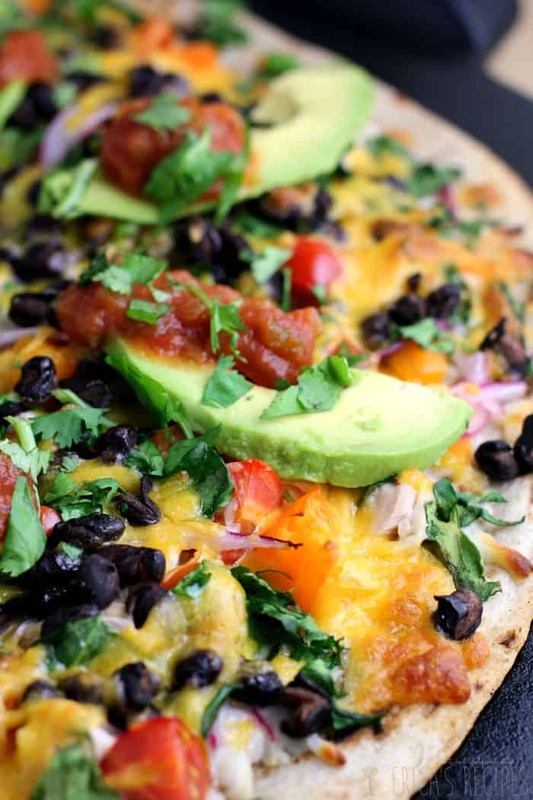 Chicken and beans, farm fresh tomatoes, and two different cheeses are just the beginning of this easy Mexican Chicken Pizza that is just so damn tasty. Easy for a weeknight, and a perfect solution for leftover chicken, this delicious pie is ready in just minutes. 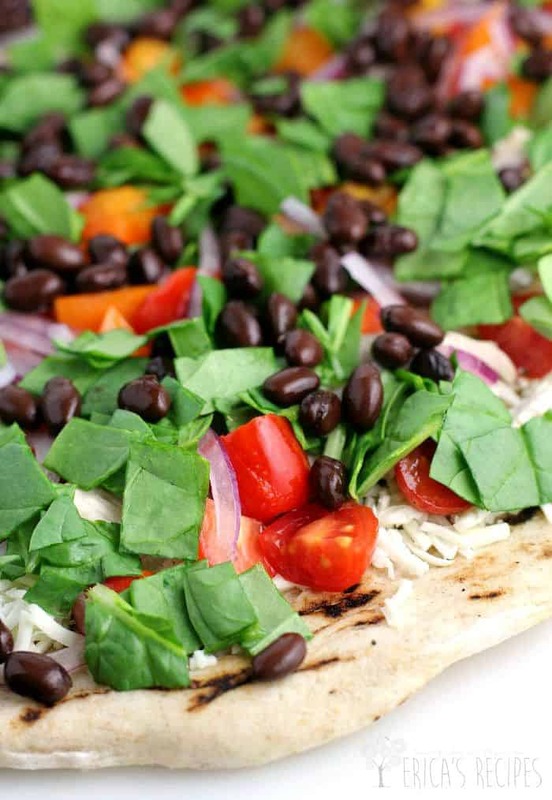 Chicken and beans, farm fresh tomatoes, and two different cheeses are just the beginning of this easy pizza that is just so damn tasty. Easy for a weeknight, and a perfect solution for leftover chicken, this delicious pie is ready in just minutes. Yayyy pizza time! Because it is Friday. Don’t you love when you just nose around your kitchen and pantry and throw something together that turns out super surprisingly awesome? …yeah, me too. So, here we sit watching and listening for updates on Hurricane/Tropical Storm/Depression ERIKA. She had us in her sights yesterday – very directly, in fact. From the prediction. Enough that I was forced to go to Walmart. But then her predicted track sifted west. Then east. Then west again. I will not be surprised if she dissipates by morning. Or not. Either way, we are good with all the necessities and accoutrements including plenty of healthy munchies and beer. My real concern is the rain. We have gotten soooooo much rain this summer – this week especially. My daughter and I drove through the worst ever torrential apocalyptic thunderstorm, complete with hail, just two nights ago. And that was not even related to Erika. So. Much. Rain. It just has nowhere to go anymore. And we are already in the middle of rain damage repair to our home, so if we get dumped on, all tropical storm-like, that could be a nightmare. …sidebar, but I was totally fine reading “Erika this, and Erika that” in the news online. …but then I came home and put on the TV and hearing “Erika this and that” is very different. Just saying. But, anyway, in the midst of this unlikely impending doom, I literally made this up on the fly. Went around the kitchen – spotted that I had grape tomatoes and a large yellow tomato to use up very soon, and a whole wheat pizza crust in the freezer. Oooh and cheeses in the freezer too. Beans check. Spinach check. Onion check. …and leftover Applewood Smoked Organic, Free-Range Chicken. Yummm. Was not planning on creating awesomeness this night – I just wanted to feed everyone and be Friday chilll. But the next thing I knew, I was taking photos. And this pizza tasted every bit as good as it looks. So, all the ingredients here are just uncomplicated and delicious. What makes this pizza really rock though are the final touches. Salsa, fresh sliced avocado, and jalapeno. Yum yum yum yum yum. With the cheese and tomatoes, this really all comes together to a very tasty bite. And this recipe uses one of my bestest little tactics for getting better food in my family – chop spinach, and slip it into ev-er-y-thing. …Noone even noticed. So here it is kids! My latest version of my favorite food. Easy pizza. Does life get better? 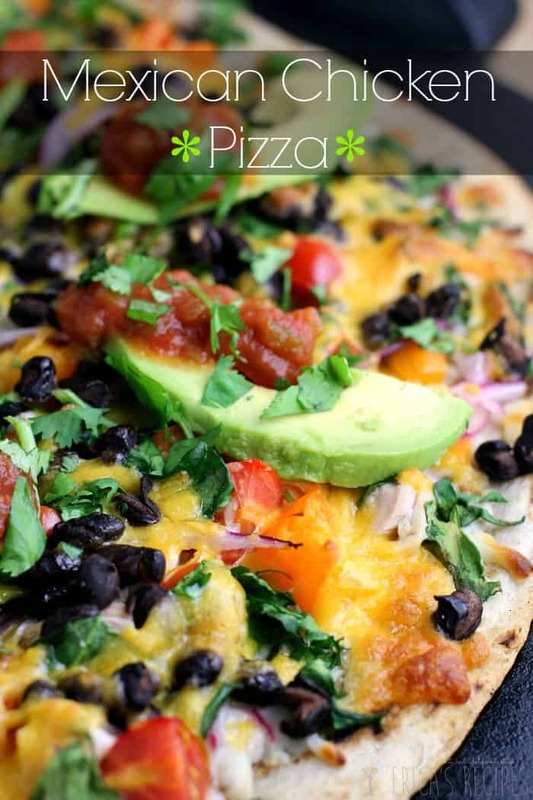 Chicken and beans, farm fresh tomatoes, and two different cheeses are just the beginning of this easy Mexican Chicken Pizza that is just so damn tasty. Heat oven with the pizza stone in the oven to 450F. While oven is heating assemble the pizza. 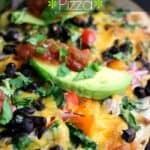 Layer the ingredients in the following order on the prepared pizza crust: mozzarella cheese (on the bottom to act as a glue and keep the other toppings on! 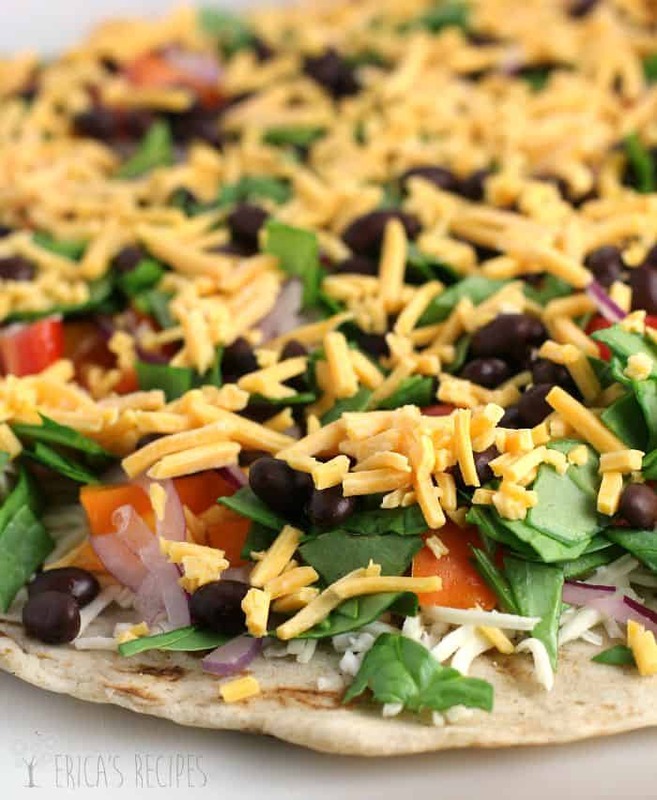 ), tomatoes, onion, spinach, beans, chicken, cheddar cheese. Transfer the pizza to the preheated pizza stone. Bake ~12 minutes or until toppings are hot and cheese is melty and golden. Yield: 1 pizza. I get my premade pizza crusts from a local gourmet shop. They are Wood Grilled Pizza Crusts from The Pizza Gourmet. I hope the impending doom isn’t too doomy! Yum. Can’t wait to try this! I’ve never tried this before, looks fantastic!! I wanna grab it from my screen. 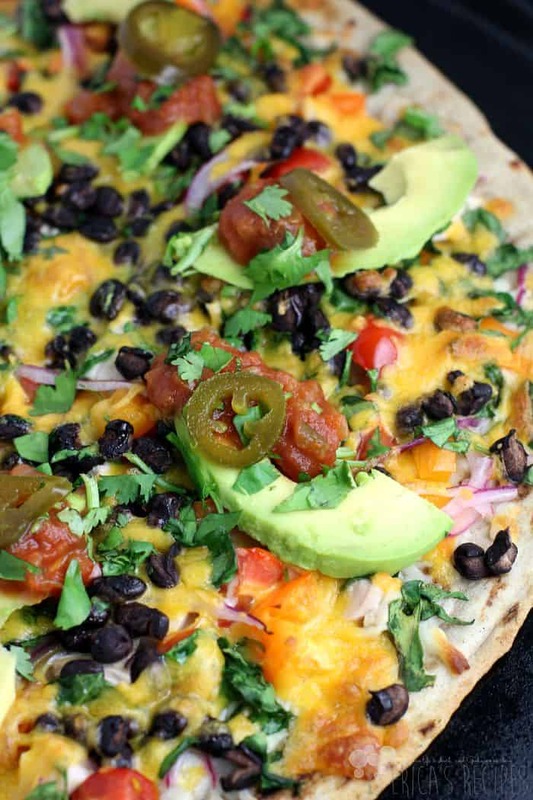 I need to try this – I love all things Mexican! Well that sure looks delicious in the pictures. I’d love to make and try that recipe here. 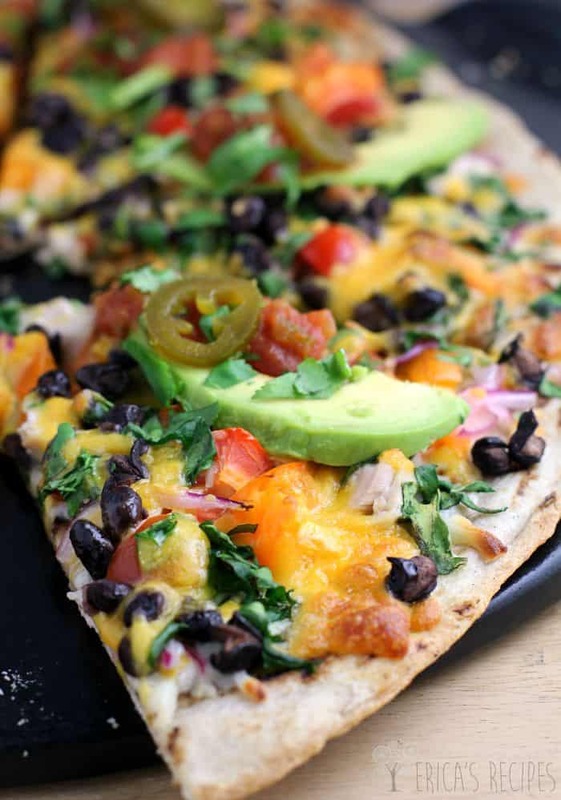 Everything about this pizza screams yum!! Great recipe, Erica!! Oh yes!! This is our kinda pizza!! Next hurricane, we’re coming to your house for sure! I’ll even bring the beer 😉 Like how I just invite myself over? heehee Glad your namesake fizzled out. We are pretty much underwater here – you need a 4×4 to tackle our driveway at this point, but whatever, ’tis the season I guess. Have a super weekend, Erika! California will take some of your rain! I’ll take a slice of pizza too. Love the fresh avocado you added. Super yum!! Where are you in Florida? That’s all we heard about for a week too – Erika! My house had flooding from all the rain we’ve had this summer, so we were NOT looking forward to more! Lol! Watching football all day, and this pizza looks like the perfect dinner for this lazy Saturday night at my house. It looks positively awesome! This looks incredible, Erica! I so want to make this! My family loves Mexican food! 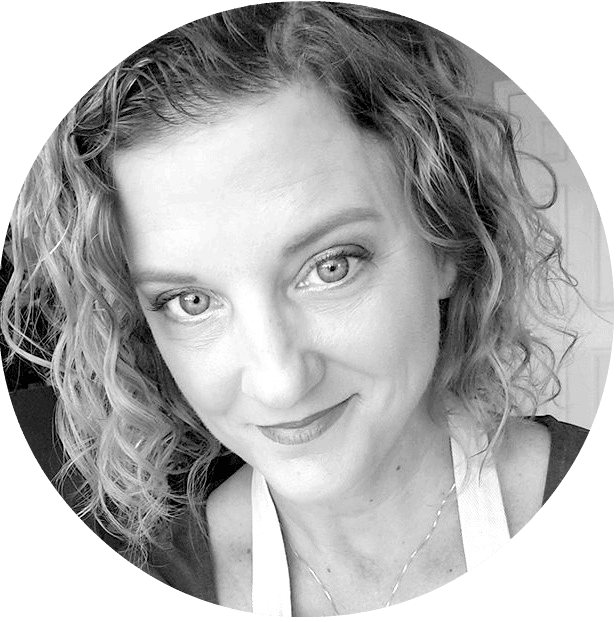 On top of a recipe for a delicious thrown together fabulous pizza, I was highly entertained reading your blog. Looks like a yummy way to wait the storm out! This pizza looks sensational Erica! Your pizza looks incredible Erica! Loving all the amazing colors and textures!! I also loved your “Erika” story! Being on the West Coast of FL we were watching the track like crazy too as we have been deluged with rain this summer. But this time we were watching it from California where were vacationing. Long story short came home one day early to avoid landing in a stormy “mess” only to have nothing but a few bad rain bands. Hey,we’ll take it, right? ?